THE FOLK and fairy tales gathered by the Grimm brothers have entranced readers and audiences for more than 100 years and the recent movie adaptation of Broadway hit, Into The Woods, attests to the stories’ enduring appeal. Now Galway Community Circus and Fidget Feet are teaming up to present two shows - Grimms Circus and Once Upon A Circus - which transport the fairytales into a thrilling new setting. Classic fairy tales mixed up into a deliciously dark story of wolves, witches, and the long way home. 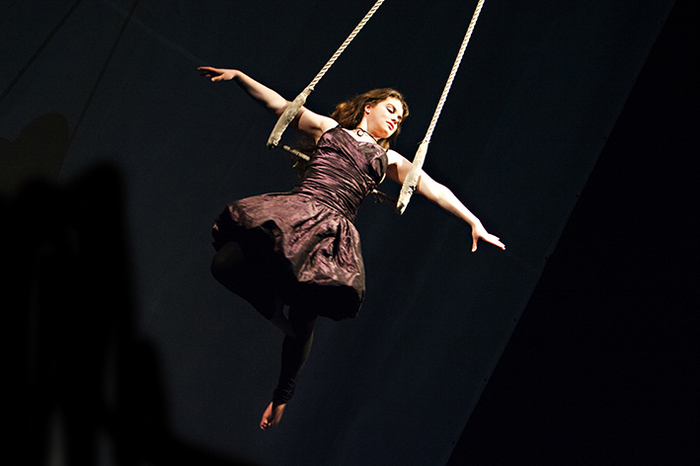 Audiences will marvel as fairies take flight in this breathtaking display of aerial dance and circus arts in this stunning youth circus spectacle. “In Grimms Circus we will be telling about 20 of their folk tales,” producer Steve Cadwell reveals. “Our director, Lee Clayton, has decided to choose lesser known ones. There will be some our audience are familiar with, along with ones they may not have heard of before. Modern re-tellings of the Grimm tales sometimes downplay the darkness to be found in the originals. Grimms Circus takes that darkness on board as an integral part of the show. “Absolutely we do,” Cadwell declares. “We are introducing a new approach to our circus where we will be incorporating shadow puppetry. That creates a stark contrast of white and black, which will be offset by colourful costumes as the show progresses.